Tax Map — Ruchelman P.L.L.C. This interactive map covers the taxation of holding companies in 15 European jurisdictions: Austria, Belgium, Cyprus, Denmark, France, Germany, Ireland, Italy, Luxembourg, Malta, the Netherlands, Spain, Sweden, Switzerland, and the United Kingdom. It looks like you are using an unsupported version of Internet Explorer. Please consider updating to version 10 or higher to continue. PLEASE NOTE: For best results, it is recommended to view the Outbound Acquisitions Interactive Tax Map using the latest version of Google Chrome, Mozilla Firefox, Apple Safari, or Microsoft Edge. All links will open in a new window and navigate you away from this site. Choose a map view in the navigation panel above. If you are using a mobile device in portrait mode, please rotate your device to landscape view now. This interactive map is a concise and comprehensible presentation of the tax regimes that govern the use of holding companies in 15 European jurisdictions, and reflects the new reality resulting from the O.E.C.D. B.E.P.S. Project and European Commission initiatives intended to eliminate cross-border tax planning arrangements. For more detailed information regarding a particular country, please look to the relevant chapter in our special edition of Insights, or visit the Downloads section. TAX REGIME Explore the contrasting treatment of various tax issues among the jurisdictions. Regimes may be chosen using the Topic dropdown menu underneath View. COUNTRY View a single country's treatment of all the tax regimes at once. Then to begin exploring, simply click a country on the map. More information will appear in a box on the right side of the map. This box may be toggled at any time by pressing the × to the left of the country's name. The information presented on this website has been adapted from the Practising Law Institute's Corporate Tax Practice Series: Strategies for Corporate Acquisitions, Dispositions, Spin-Offs, Joint Ventures, Reorganizations & Restructurings 2018, edited by Louis S. Freeman; www.pli.edu. The scope of this interactive map is limited to the E.U. Member States (and Switzerland) included therein, and has been revised as of June 2018. Click to download a summary chart of the holding company regimes addressed on this website as a PDF (2017). 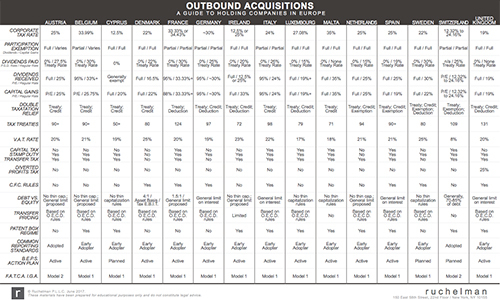 The full text of the source article, "Outbound Acquisitions," is available as a special edition of the Insights tax journal. Editions prior to 2015 are available in plain PDF.